I always kinda assumed that rowing machines would be really expensive. Too expensive to realistically include in your typical home gym. Turns out I was wrong! Rowers, much like all cardio equipment, come in different price ranges based on what you are looking forward. Some of the best rowing machines for home use can be purchased for under $1000! Rowing machines, or rowers, provide a great cardiovascular workout. Sometimes it’s nice to get a cardio workout without having to plug along on a treadmill or bike. A rowing machine offers a great alternative. I’ve used the rowing machines at public gyms before intermittently. I was never a big rower or anything, I mostly used them when I was bored with the usual treadmill or elliptical workout. It’s a fun alternative to the other cardio machines available. I did the research to bring you some high-quality rowing machines in 3 different price ranges. The 3 machines listed below each have something to offer rowers regardless of skill or fitness level. Before we start comparing the different options, I want to start with a quick discussion on the benefits of rowing and the different types of rowing machines available to the consumer. Have you ever rowed before? If you are reading a review on rowing machines, then hopefully the answer is ‘yes’. So you know that rowing is a great cardiovascular workout. You know how difficult rowing can be. I like rowing because you can really adjust the intensity of your workout by how hard you are pulling. The harder you pull, the more resistance you get (usually) and the more difficult the workout becomes. Another great thing about rowing, is that it includes your arms! A lot of cardio equipment relies solely or mostly on your legs. Treadmills, ellipticals, bikes…all legs. There’s good reason for this, the muscles in our legs are much bigger than the muscles in our arms so they burn more calories when they work. That said, it’s fun to switch it up and get our arms involved sometimes too. Rowing is a great cardiovascular exercise, gets the heart rate up, gets us burning calories. But it’s also a great strengthening exercise for our backs and arms. Lats, rhomboids, spinal extensors, biceps…all working when you row. Last, but definitely not least, rowing is a pretty low impact form of exercise. Not a lot of impact going on in your joints when you row, especially if you are rowing with proper technique. The smooth glide of the seat eliminates the impact on your hips and knees. You have to be careful with your low back if you are prone to back injury, but rowing is a comfortable alternative for folks who have difficulty performing other cardio exercises due to hip or knee problems. Ok, enough is enough. You know what a rower is and why it is good for ya. Time to get to the review. When comparing pieces of exercise equipment, I like to present quality machines in different price ranges. There is no “one price ranges fits all”. If you are on a limited budget, there is no reason you can’t still get a nice piece of equipment that will meet your needs. If you have a larger budget, it’s important to know what paying more gets you. Just because something is more expensive, doesn’t necessarily mean it’s a nicer machine. For this review, I chose these 3 price ranges: “under $300”, “$400 – $1000”, and “over $1000″. Let’s get to it with the first category. I first learned about this manufacturer when I was researching spin bikes. I was really impressed with one of their bikes and I’m really impressed with this rower. You just can’t beat their prices. Sunny Health and Fitness is making a name for themselves by offering solid products at rock-bottom prices. The SF-RW5515 is a very highly-rated machine on Amazon, with average rating of 4.3/5 with over 500 reviews. 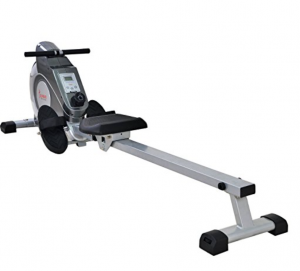 This rower is perfect for novice rowers or people who are only rowing a few times a week. This rowing machine is probably not going to hold up to a strong rower or for multiple users over a long time. But for $200, you can’t go wrong with this product. Yea, sorry about the “cons” section, I really couldn’t find any negative reviews on this product! I think it’s the most highly-rated product I’ve ever seen on Amazon…4.9/5 with over 1,400 reviews! Enough said. Everybody loves this rower. 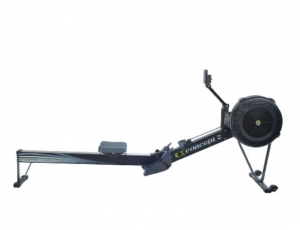 It’s considered the gold standard for rowing machines and you can put one in your home for less than a $1000. I mean seriously, Olympic athletes train on these things. These rowers are built to last through intense workouts, as you can tell by the 500lb weight capacity. Also includes an impressive warranty. The wind resistance provided by the flywheel will give you a more natural feel while rowing, close to the feel of pulling through water. The only reason I could see not buying this rower would be if the cost is just way out of your price range. I think the wood frame looks great. But remember, you can’t judge a book by its cover…but in this case everything else is awesome too. This rowing machine was obviously designed with commercial use in mind. It’s as durable as they come, I mean it seriously has a 1000 lb max weight limit. I’ve used a water rower at the gym before (different model) and I have to say it’s really cool to hear the water splashing as you row. It definitely gives you the sensation of rowing a boat. This is another very highly-rated product on Amazon, average rating of 4.7/5. This is a top of the line rowing machine if your budget allows it. If I had this rower, I would put it in my living room…somewhere everyone could see it…gorgeous! Click here to check it out in “black walnut”…stunning! I’ve done the research to bring you 3 of the best rowing machines available for home use. If you’re like me, before you buy anything online, you do a couple hours worth of research comparing models, comparing prices, and then comparing again. Well, that’s what I just did for ya…you’re welcome. I came up with what I considered to be the best buy for each of the above price ranges. It’s usually not fair to compare a $300 machine to a $1000 machine. The fact is, the more expensive models are usually more expensive for a reason: higher quality. This in no way means you have to buy a more expensive model to find something that will work great for you. Depending on your fitness level and exercise needs, you may do fine with a cheaper product. Especially in this case. The SF-RW5515 is a GREAT buy at $200. Before I discovered the Sunny Health and Fitness brand, I would never have considered a piece of exercise equipment in that price range. Seriously. If you bought something that cheap you could be guaranteed that it would be flimsy and last about 2 weeks before you were replacing it. Luckily, now we have products from Sunny Health and Fitness that are providing great products at great prices. 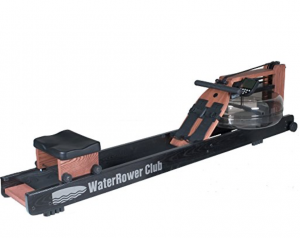 I’m kinda in love with the beautiful WaterRower Club Rowing Machine in black walnut, but of the 3 rowers discussed above, I would pick the Concept2 Model D Indoor Rowing Machine. It’s considered to be the perfect rower. It’s built to last, it provides smooth air-resistance with it’s flywheel design, and its under $1000. Like I mentioned above, it’s used by Olympic athletes, so you know it holds up to a beating. I also like that it got a 4.9/5 on Amazon (I seriously couldn’t find any problems with this rower). If you are interested in a more comprehensive look at the best rowing machines on the market, you should check out my rowing machine buyer’s guide. I hope this review was helpful. If you have any further questions about these or any other rowing machines, hit me up with a comment and I’ll get back to you soon. If anybody already owns any of these rowing machines, I want to hear from you as well. Great review! I always wondered how much a rowing machine would cost, and you broke that down nicely. I would imagine these machines as being completely out of budget, but like you said, realistically, they aren’t. The price range varies quite a bit, but like they say, you get what you pay for, right? Thanks. Yeah, I figured these machines would be really expensive too, I never realized how affordable some of the models are. Even the really nice, more expensive models aren’t too bad when you start comparing them to commercial grade treadmills that can easily run $6000-$7000. It’s true, the more expensive products are usually more expensive for a reason, higher quality materials and nicer accessories. I hope the review shows though, that there are some high quality rowers in the affordable price range. It’s good to see that there are actually high quality gym equipment in a low price range. I heard a while ago that rowing was actually more intense than running. Is this true? Can I actually burn more calories and increase strength from using the row machine? If so I’m sold man. Such an awesome idea. Rowing, like any other exercise, can really be as intense as you want to make it. Great thing about the fan and water rowers, the harder you pull, the more resistance you get! Comparing rowing and running is a pretty tough one, all depends on how fast you are running and how hard you are pulling. I recently saw a statistic that said you can burn about 300 calories in 30 min on a rower, rowing at a moderate pace– your average guy burns somewhere between 125-150 calories per mile running…so, all depends on your running pace. You can definitely increase strength with a rowing machine though. Hope this helps.